for Weekend Getaways or closet storage? 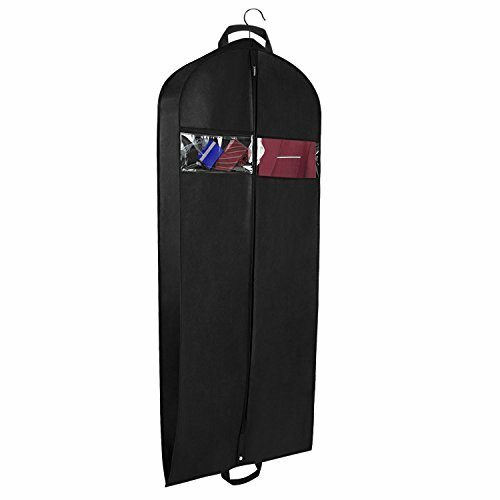 ✓ Garment bag size: 24" x 60" x 5.9"
【Double Carry Handles & Metal Grommet】Gusseted 60" garment suit dress bag with durable metal grommet allow hangers to pass through for folding during light travel, with double handle that allows you to transport without dragging your garments on the ground. 【Double Pocket Clear & Visible Window】 Coat cover travelling bag with a clear pocket zipper bag front and a large pocket zipper bag behind the dress suit garment bag for more storage and save space. You can storage tie, jewelry, power bank, iPad etc; with clear PVC window so you can easily identify which clothes inside without opening the hanging clothes bag. 【 You Will Get】 1 x Gusseted 60" garment travel bag ( 24'' x 60 ''x5.9" ) It's perfect for all your travel and storage needs. 1year warranty by Zilink. If you have any questions about this product by Zilink, contact us by completing and submitting the form below. If you are looking for a specif part number, please include it with your message.